For more information about these exhibits, contact Sally Grubb at (607) 272-4557 extension 232 or sgrubb@tcpl.org. 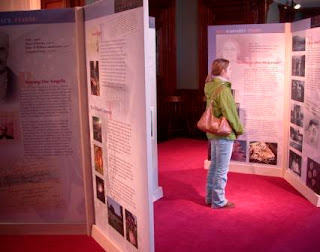 For information on exhibits before 2012, visit TCPL's exhibit archive. Individual blog posts since 2012 are archived below. 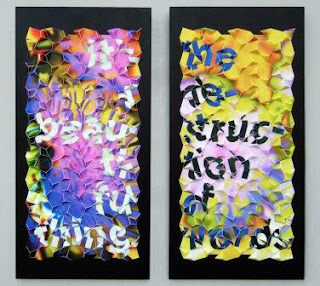 Tompkins County Public Library offers after-hours access to two powerful exhibits during Downtown Ithaca’s Gallery Night on Friday October 4. From 5 to 8 p.m., art, history and literature enthusiasts as well as members of the human services community are invited to view The Lives they Left Behind: Suitcases from a State Hospital Attic and BANNED!, an exhibit celebrating the freedom to read. A humbling and heart-wrenching glimpse into the forgotten lives of residents of Willard Psychiatric Center, The Lives They Left Behind is a traveling exhibit featuring photographic and written profiles of patients whose stories were uncovered when 400 discarded suitcases were found in a hospital attic after the Center’s 1995 closing. In addition to the traveling exhibit, some of the actual suitcases preserved by the New York State Museum will also be on display. The Lives They Left Behind was developed by The Community Consortium and is circulated by the Exhibition Alliance, Inc. of Hamilton, NY. The Library exhibit is presented by the National Association on Mental Illness—Finger Lakes, and co-sponsored by the Mental Health Association in Tompkins County and The History Center in Tompkins County. It is made possible with grant support from Janssen Pharmaceuticals. BANNED!, curated by Suzanne Onodera, offers a thought-provoking look at banned and challenged books throughout history. Its 17 artists, poets and librarians were asked to comment in words and images on censorship and the banning of books in this country. This timely exhibit features artists as young as 9-years-old and draws attention to the current and growing issue of censorship, challenging and banning of books and free and open access to information. Artists will be present at the opening. Take advantage of the opportunity to meet them and discuss their choice of books. The exhibit has been made possible by the Tompkins County Public Library Foundation with grant support from the Community Arts Partnership. Gallery Night access to the Library will be through the BorgWarner Community Room door behind the TCAT bus shelter on Green Street.